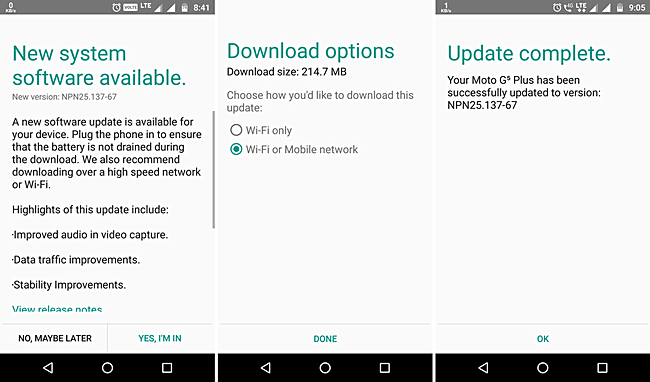 Motorola has started pushing out a new update to its Moto G5 Plus smartphone. Arriving as version NPN25.137-67 and weighing in at around 215MB, the update brings along several changes, including improved audio in video capture. Other changes that the update includes are improvements related to data traffic as well as the device's stability. Also, the VoLTE icon in the status bar has been replaced with a 4G icon. Note that the change related to audio quality in video was also there in the update that was rolled out back in March, but that was a different update with firmware build NPN25.137-33 and 280MB size. A quick look at Lenovo forums reveals this new update is currently hitting units in India, although other markets may also be getting it. I have received security update for 1st November 2017 today.